The Dremel Multi-Max MM40-05 lives up to its name. It has all the top of the line features you would expect from a quality and professional tool brand. This made it one of the most powerful DIY friendly oscillating tools within its price range. The MM40-05 is an all-rounder tool for tackling a variety of works in a project. 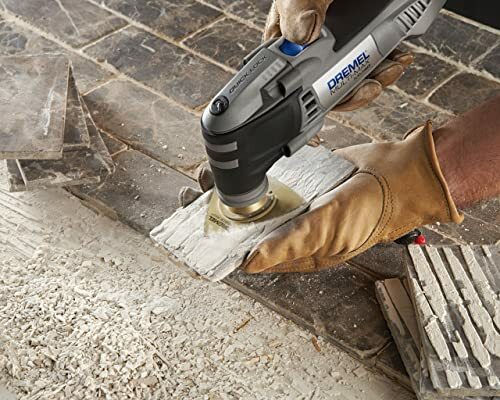 It is a powerful and versatile tool from Dremel, a brand that is recognized for the high performance of its tools offerings. The Dremel Multi-Max MM40-05 is probably the most powerful and friendly DIY tool available in its class. 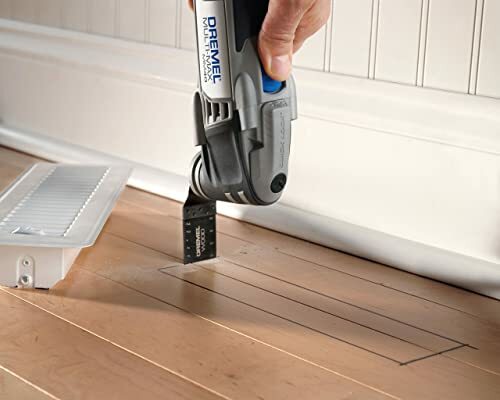 There’s a reason this Dremel Multi-Max tool is tagged one of the fastest and versatile DIY friendly tools. This is because the tool saves time when you’re tackling various works of a project. It comes with 36 accessories, which means, you can easily find the blade or accessories that suits your application. The tool is very easy to use. Just fix the blade that suits your task, plugs into the electrical outlet, switch it on with its separate on and off key, and you are good to go. As an avid DIYer who jumbles from one renovation task to the other, I needed a powerful but affordable tool to replace my broken tool and complete my bathroom renovation project. I got this Dremel oscillating tool, and I found the tool pretty amazing. With its MM502 0.0625” grout blade, I was able to cut down into my old unsightly grout and knock them out faster than I could with my broken tool. What amazes me was the speed at which I was able to do this and complete the task without damaging the tiles. The tool also worked great when cutting away the corroded screw holding my toilet bowl to the ground when I needed to remove and replace it with an updated version. I thought this would be impossible but thanks to the MM485 Carbide Blade, powerful 3.8 amp motor, it was able to complete the job without wasting my precious time. Dremel MM40-05 has a variable speed dial located at the back of the handle. With this, I can just get the tool ripping light and slow or hard and fast by scrolling my thumb on the wheel to adjust or select the right speed for the task. Variable speed ensures I can make a delicate and intricate cut and this is no longer like trying to hold a bull by the horns. Another feature I liked about the tool is the Quick-boost electronic feedback control that maintains a constant speed while working through tougher surfaces. Little wonder I was able to tackle those demanding jobs with absolute ease. My old tool came with only a scrapper and a cutting blade, but my Dremel multi tool included the sanding pads as well. I was eager to try them, and I found the tool’s handy accessory changing system (known as the Quick-lock and Quick-hold magnetic interface) really helpful. By just flipping the lock, I can quickly remove the blade without the need for special tools. And no matter how I jam the blade into the tool, it would go into only one proven position and fit into the magnetic interface. The tool feels solid and has a weight that is right in line with its competitors. It has a rubberized grip to safely and securely hold the unit while working. Although the tool is built to be strong and durable, it comes with a 2-year warranty against factory defects and also includes a storage case to hold the tool along with its 36 accessories. From my survey, a very small percentage of its users complained about the tool’s blade locking system in that the tool’s blade locking pins tends to wear out over time. I had the tool for over six months with constant use and had no issues with the blade locking system, but I think it would be okay if I bring this to your notice. The following tips will be very helpful in improving your safety, giving you a better experience of the tool. For your safety, unplug the tool before you change the blade and accessories. (Note that the switch is recessed and you may accidentally activate the tool if you grip it at the on/off switch location while changing the blade). The tool works perfect for sanding on small surfaces and tight spaces, but you need to get your workspace illuminated to carry out a perfect job. 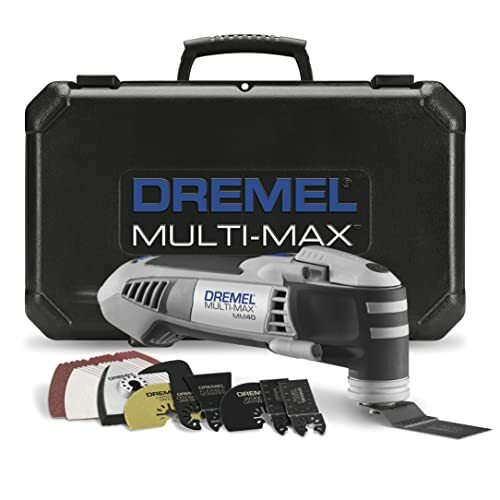 If you are looking for a powerful and affordable oscillating tool, the Dremel Multi-Max MM40-05 is your best bet. Even with the drawbacks, the tool still manages to compete with other high-end tools giving them a good run for their money. No wonder it is tagged the fastest and the highest power in its class.